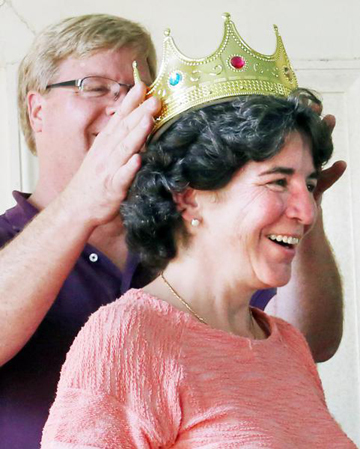 Pudding Head Leslie Clark is crowned by judge Damon Herring. Courtesy of the Recorder. 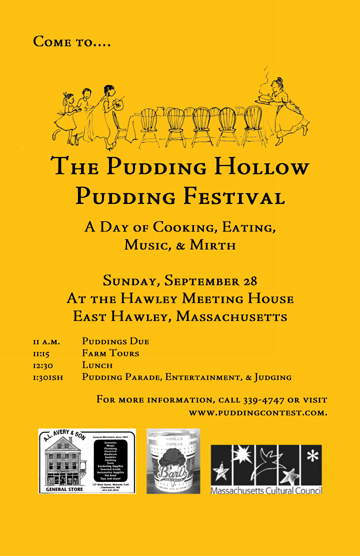 Last week the Sons & Daughters of Hawley, the historical society in my small town, hosted the intermittent but always highly enjoyable Pudding Hollow Pudding Festival. This event started out as the launching event for my Pudding Hollow Cookbook—and kept going because it was so much darn fun on its own. The person who wins the pudding contest that is the centerpiece of the festival is dubbed the new Pudding Head. Leslie Clark moved to town in August and lives right next door to me! She is proving to be a terrific neighbor and a darn good cook. Here is Leslie’s prize-winning recipe. I haven’t tasted it yet, but from the judges’ reactions and from the ingredients, I know I will love it. This event isn’t just delicious. It’s also a tribute to the power of community … and of course of food! Met the sugar in a pan with the cinnamon. Spread this melted syrup in the bottom and sides of a baking bowl, reserving about 1/4 cup for later decoration. Allow to cool. Preheat the oven to 325 degrees. Using a hand or electric mixer, blend the eggs, liquids, and nutmeg for 5 minutes. Pour this mixture into the sugar-lined baking bowl. 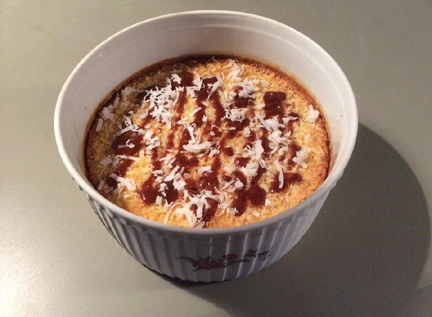 Top with shredded coconut uniformly. Bake in a bain marie (hot-water bath) for 1 hour, or until a knife inserted into the custard comes out clean.